I like trying new and different vanilla frosting recipes, but when I need a solid tried and true recipe for topping cupcakes, this is my favorite vanilla frosting. It has plenty of butter, high quality vanilla and a little salt to offset the sweetness. You can make it with any brand of vanilla extract or for a change of pace, vanilla bean paste. 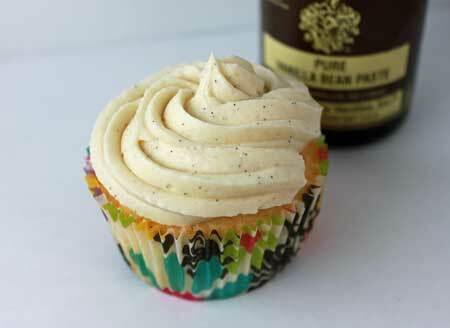 The frosting in the photo has vanilla bean paste, hence the speckles of vanilla bean. Beat the butter with an electric mixer until it is soft. Gradually add the powdered sugar, scraping the sides of the bowl. Add the vanilla some of the milk. Beat on high until light and creamy, scraping sides of bowl. Add remaining milk if needed. Taste test and add more sugar, vanilla or milk to get the consistency you want.